Tuesday night was crazy at Heist! We had a great line up with four of our sweet Pelonkey DJs who spin it to win it: DJ Neekola, DJ Oz, Phlipz, and Carlos DeLarosa! 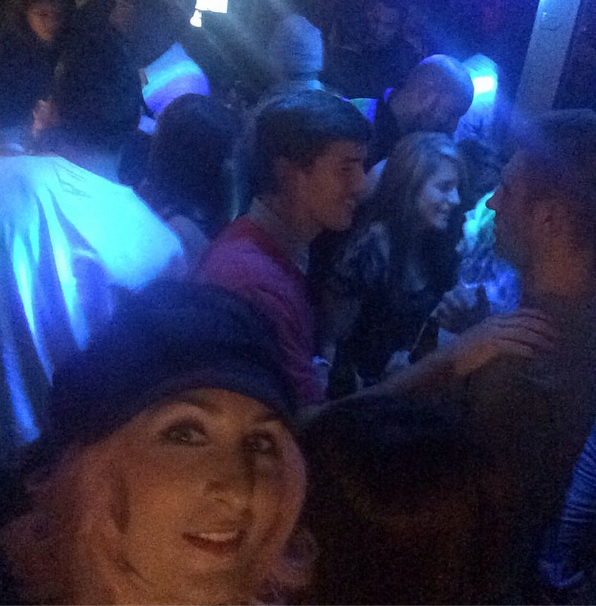 The entire lounge was packed, and everyone wanted to dance to the amazing beats of the DJs! It was a house and hip-hop kind of night. Heist is always crazy on Tuesday nights, and everyone was looking to get in one more big night before Thanksgiving festivities began. Thanks to Heist for always having all of our super dope DJs come out and perform! Pelonkey DJs Neekola, Alkimist, Phlipz, and Vicious spin at Heist for DJ Beaini’s birthday bash! Modified from Ciera Gallub‘s post on DJNeekola.com 9/18/14. Last Tuesday night at Heist was off the chain! Not only did a handful of Pelonkey‘s best DJs get together for the infamous Heist Industry Tuesdays evening of shenanigans, it was DJ Beaini‘s birthday bash celebration! Heist was stuffed with dancing people all night long, popping bottles, sparklers flying, and nuttiness ensuing, all thanks to Neekola, Vicious, Phlipz, and Alkimist bustin’ out their killer jams. It was such a great party! Tuesdays are always awesome nights at Heist, and celebrating DJ Beaini’s birthday only made it that much more fun for our awesome Pelonkey DJs to perform! Make sure you catch the next Industry Tuesday at Heist! They are not nights to be missed! Pelonkey DJs rock the decks at Heist for Industry Tuesdays! 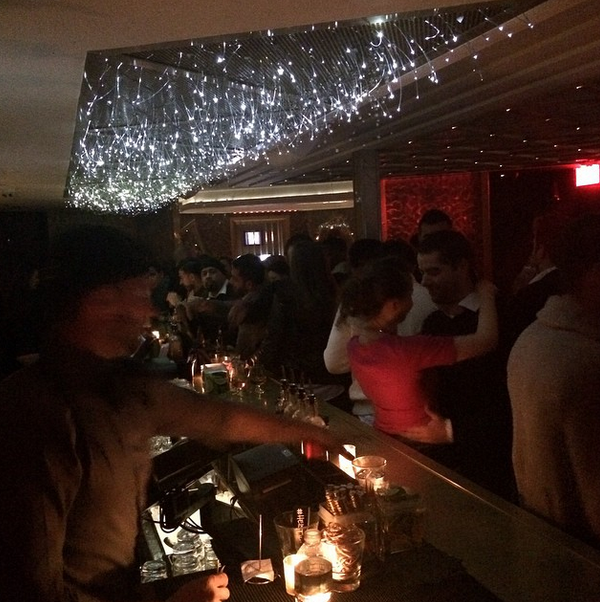 Our amazing DC DJs were back at it again last Tuesday night! 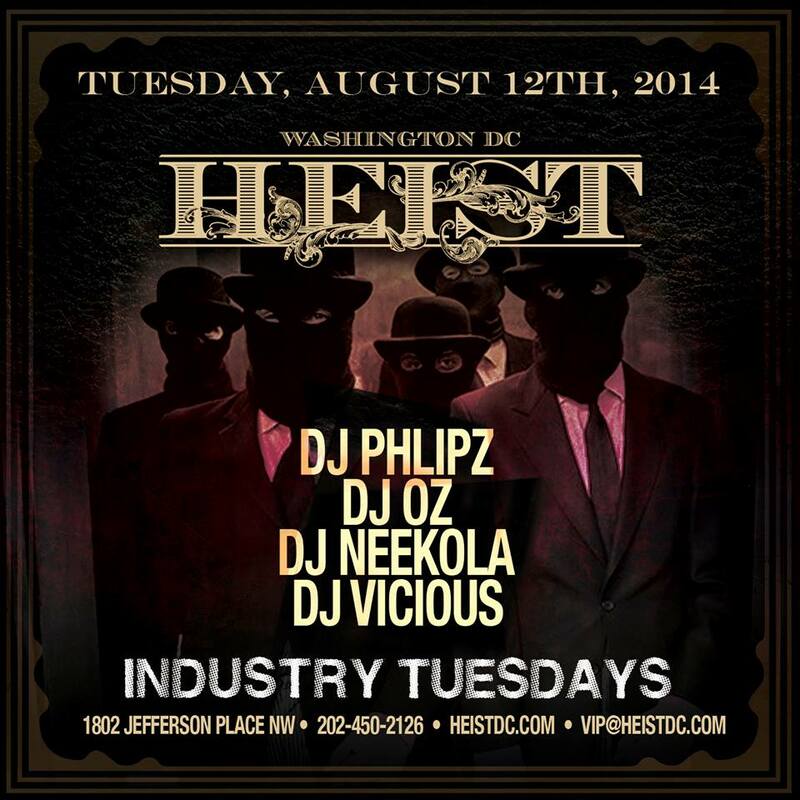 DJ Oz, DJ Vicious, Phlipz, and Pelonkey‘s very own CEO DJ Neekola shredded the decks at Heist for their Industry Tuesdays! Switching back and forth for various sets, some heavy house, hip hop, electro, and modern hits were mixed and mashed, keeping the bottles popping, the tables full, and the dance floor packed the entire night! We can’t wait to have our awesome Pelonkey DJs rock the night at Heist again! Catch different peeps every Tuesday night, making magic happen. To make your table reservations, click here – see you there! It was another killer night at Heist for their Industry Tuesdays! This week’s lineup was solid, featuring Vicious, Amen Ra, Oz, and Neekola, all super dope Pelonkey DJs! The party was so awesome, Will.I.Am from the Black Eyed Peas showed up to mix in some of his hot 90’s beats! As always, Heist delivered a solid party. The energy was great, and the lounge was solid packed til they shut it down. Thanks for having our awesome Pelonkey DJs! Always a pleasure, and we can’t wait til next week! 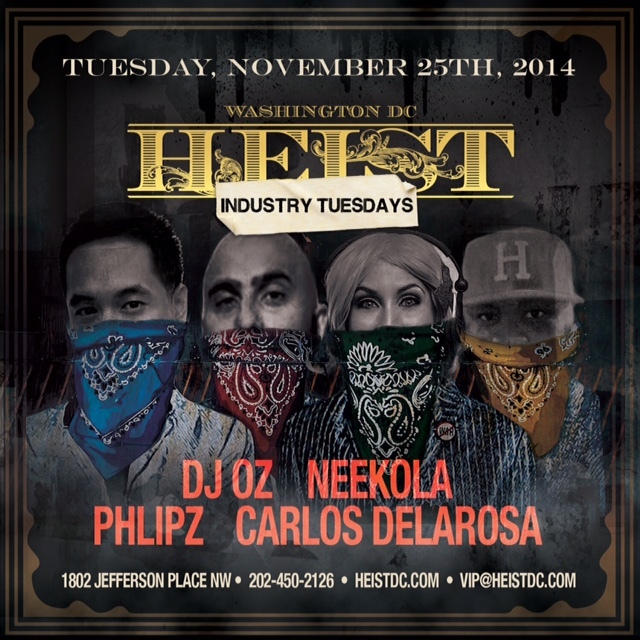 #IndustryTuesdays at @HeistDC with @DJNeekola, @DJ_Vicious, @DJPhlipz, and @DJAlkimist! 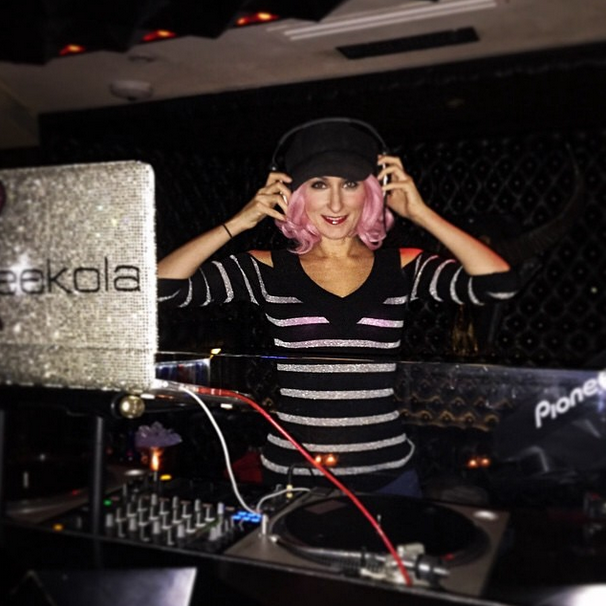 Last Tuesday night, the awesome DC DJs of Pelonkey rocked the decks at Heist! DJ Neekola, DJ Alkimist, Phlipz, and Vicious shredded the vinyl, keeping the dance floor full the entire night! Tuesdays nights at Heist are the best nights for all the city industry people to go out, and by the time midnight rolls around, the entire lounge is packed! People were popping bottles and dancing til the club closed! These awesome Pelonkey DJs totally rocked it out! Great job, ladies and gents, with another excellent performance at Heist! Don’t miss this coming Tuesday’s DJ Takeover at Heist, with upwards of 10 DJs rotating on the decks! See you there!